I twittered last month about my photo opportunity with Uno at Three Dog Bakery. Uno is the beagle who won Best in Show at the Westminster Kennel Club dog show this year. Here is the photo of me with Uno. 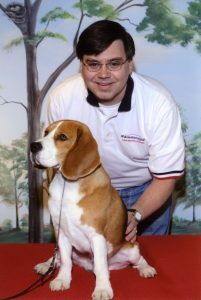 Scott poses with Uno, the winner of Best in Show at the Westminster Kennel Club Dog Show for 2008.